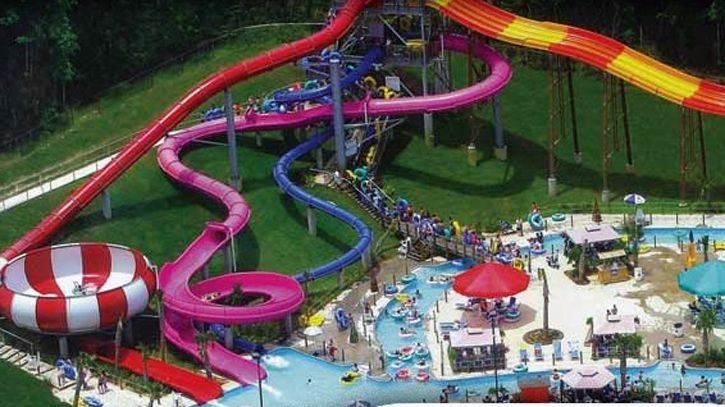 Should You Visit Mississippi's Grand Paradise Water Park? Are the Slides and Attractions Worth a Visit? A medium-sized park, Grand Paradise offers a great way to cool down amid Mississippi's heat and humidity and have watery fun. Unlike many other water parks, Grand Paradise doesn't really have a defined theme. Its name, however, implies a general sense of "paradise" and hints at a tropical vibe. Among the park's more thrilling attractions is the the AquaTWIST looping slide. As with all such water park attractions, AquaTWIST doesn't actually send riders into a vertical loop; rather, it twists sideways and approximates a loop. More moderate attractions include the Paradise Lazy River and the Grand Paradise Pool, which offers a place to stay cool and has smaller slides and activities. Younger visitors would want to head to Waddleland, a water play area with splashpads, fountains, and other features, as well as The Water Fort, an interactive water play structure with sprayers, water curtains, and a large tipping bucket. Grand Paradise doesn't have as many water slides and attractions as larger water parks, nor does it have more high profile attractions such as an uphill water coaster, a funnel ride, or a "FlowRider" Surfing Ride. But it does offer a decent number and variety of slides and attractions. Juniors (under 48") pay a reduced rate. 42" and under are free. Military and senior discounts are available. Two-day passes are available. Season pass and group tickets are available. Parking is free. Food for sale includes pizza, burgers, hot dogs, BBQ pork sandwiches, chicken strips, and funnel cake. Note that Grand Paradise does not allow guests to bring in their own food, coolers, or alcoholic beverages. Grand Paradise has a party area for groups to celebrate birthdays or other special occasions, as well for outings and events. It offers party packages that include food, drinks, goodie bags, and balloons. The park is open daily from late May to early August. It operates on a limited schedule in mid May and from early August through early September. The park is located at 50 Grandview Drive in Collins, Mississippi. From Jackson, take Highway 49 S. From Gulfport, take Highway 49 N. Grand Paradise Waterpark is located near the intersection of Highways 84 and 49, behind Collins Inn & Suites. Geyser Falls in Choctaw, Mississippi. It is part of the Pearl River Resort casino complex and includes a full-service restaurant with live entertainment. Gulf Islands Waterpark in Gulfport, Mississippi. This is a large park with an uphill water coaster, a family raft ride, and a wave pool. Which Should You Visit: Hong Kong or Singapore?